Happy New Year – happy days ! 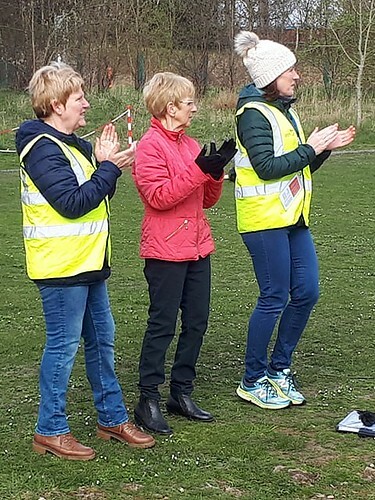 How do you smash your event’s previous attendance record, host 176 first time Poolsbrook parkrun visitors and still put on a happy event with lots of smiling volunteers ? The answer is preparation, contingency planning and wonderful people who were able to keep smiling whatever was thrown at them. Today, for the second New Years day running we smashed our attendance record. 617 walkers, runners and joggers increased our record by a massive 144 people. Looking back we have now held three New Year’s day events, in 2017 we had 289, and in 2018 we had 473 – can anyone guess how many we might see in 2020 ? Last year, we ran out of finish tokens (quite unexpectedly) and were close to our stopwatches running out of storage, but we managed by recording all finishers after our final finish token manually and had plans in place in case we needed to record finishers times manually as well. This year we planned well in advance – we got stopwatches with more capacity (up to 2000 records) with 3 timekeepers, we got more finish tokens (up to the high 600’s) – although at one point we considered that we may have to start using manual recording again ! We got an extra barcode scanner to process finishers quicker. We extended the finish funnel quite significantly – and even this wasn’t enough for a while – so we moved the finish back a few meters to extend the funnel further and then moved it back again once the queues died down. We had funnel managers helping people to move through the finish funnel as quickly as possible. 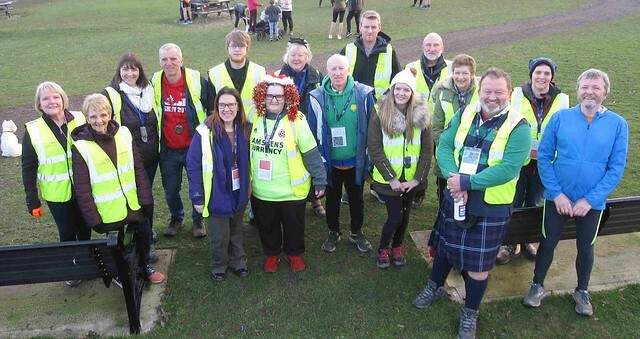 We had extra marshals in place around busy parts of the route, we also had car park marshals who helped people to find somewhere to park knowing that the two main car parks would be full very quickly. So, I would say that we were well prepared and in general, everything went like clockwork. 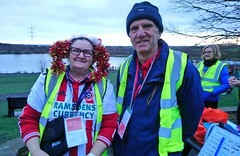 However, most of all – the event went very well because we had great volunteers who managed to keep smiling from the start of the event to the finish, even when things were getting hectic – I did not hear one complaint from volunteers or participants, all I heard was praise and happy conversations. Thank you to everyone who took part today and a very special thanks to all of the wonderful volunteers - Andy MORRIS • Cath BADHAM • Cherry HAZLEHURST • Chris PATTISON • Clare MCSHANE • David JENKINSON • David SMITH • Diane GUNN • Gabbie PATTISON • Gemma MORRIS • Gordon HARDING • Heather HILL • Henry KAY • Janet CHAPMAN • Jean BAKER • Jess JOEL • Karen JENKINSON • Keith HUDSON • Louise LOWE • Luke PAYNE • Mark HAZLEHURST • Michael JOEL • Roger KENCH • Roy SMITH • Ruth SMITH • Simon STOKES • Stephen RUNDELL • Teresa PAYNE • Tina HENSEY • William STREET. So, 617 participants, that’s a lot of people in our beautiful country park, and it was also a magnificent sight. To see so many colourful shirts, so many smiling faces – it was wonderful. 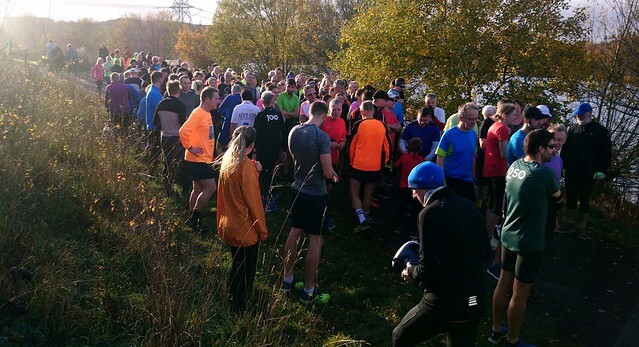 Of the 617 it turns out that 130 had completed Graves parkrun beforehand, 121 came from Clumber, 35 from Bakewell, 23 from Sheffield Castle and 1 from Shipley parkrun – wow ! This equates to more than half of those that took part at Poolsbrook today, that’s impressive. This is the only day of the year that you can register 2 runs in a day, and judging by the numbers nationally – we took advantage of this in droves. 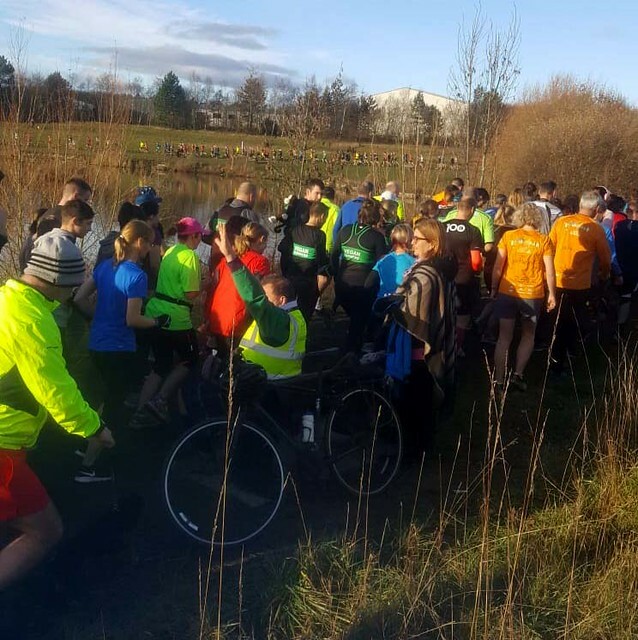 Of the 176 people taking part at Poolsbrook parkrun for the first time 16 were doing their first ever parkrun – it’s a great New Year’s resolution to follow. 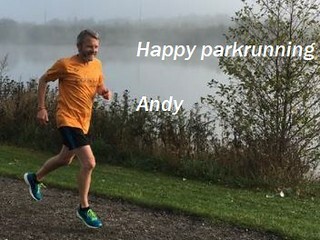 Welcome to first time parkrunners Andrew HORNER, Andy BARLOW, Caleb RIMMER, Cathy RATCLIFFE, Charlie TOPHAM, Claire CRABB, Diane PETERNEL, Dominic TURNER, Elliott DYSON, Isobelle CRABB, John FERGUSON, Juliet FIDORRA, Kate GOUGH, Martin MCSHANE, Matilda CRABB, Ryan BERRY. There were far too many first time visitors to name, so a big welcome to all of you – we hope that you enjoyed our ‘little’ event. Did you see the photo montage displayed near the café ? If not, well you will still get chance – I’ll bring it along again in the next few weeks – see if you can spot yourself. Watching the massive crowd making it’s way to the start line was amazing and when we got there it was a sight to see with so many people crowded together on the path and the verges. It’s a good job that we are a friendly lot as it was quite a challenge to get past the fast runners to find a reasonable place to start in the pack. 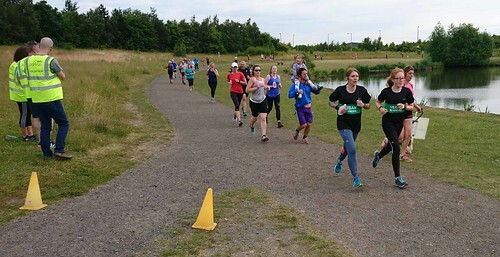 I ran at Graves prior to Poolsbrook this morning and wasn’t sure how I’d get on with a second parkrun (given my current state of fitness) – however, I needn’t have worried as the enthusiasm of my fellow runners ensured that I and everyone else had a lovely run. 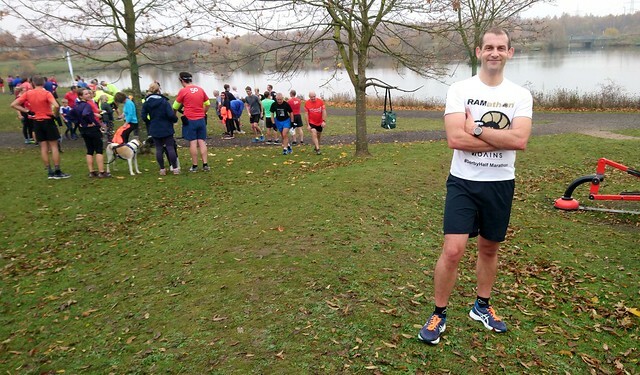 Gordon Harding ran at Poolsbrook parkrun for the 100th time out of his 104 parkruns. Chris Payne, our regular visually impaired walker completed his first parkrun double (Graves first) whilst raising money for the Paralympic sport of goalball. Not surprisingly with such a high number of participants, the field spread out quickly and runners, joggers and walkers could be seen all around the route after a few minutes. Impressively, given the fact that so many were doing the second part of their ‘double’ there were still 57 Personal Bests – well done if that was you. At the finish line it looked hectic and we were pleased to have taken all of the precautions that we took as they worked a treat and we were ready to deal with lots of people crossing the finish line in quick succession. After consideration, we have agreed that the only thing we might have changed would to be make the finish funnel even longer ! It was already the longest funnel that we have ever had, but perhaps we will modify it next year. The timekeepers did a sterling job staying relatively well synchronised as did the token volunteers who were giving them out at an unprecedented rate. The barcode scanners were kept busy and did a wonderful job with very few scanning issues and they were supported by the number checker who filled a sheet with non-scanning barcodes. We had four of our precious finish tokens go missing today – I know that we always go on about handing them in when your barcode is scanned but it’s for a reason, we only have one set and we have to pay for replacements in blocks of 500 ! To mitigate this cost we have some blank tokens onto which we stick barcodes but these aren’t as robust as the originals – so can we please have them back this week. 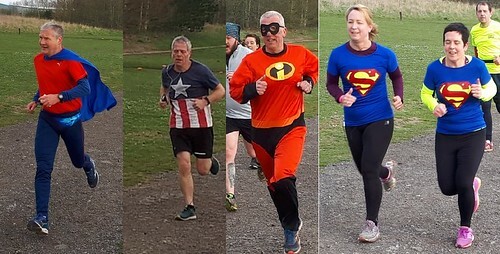 Today the four that went missing were for positions 373, 374, 495 and 545 – if this was you or someone that you know please e-mail us at poolsbrookoffice@parkrun.com so we can arrange to get them back. What an amazing sight it was at poolsbrook this morning, so many runners,walkers,joggers and volunteers. This was my 70th parkrun and I finished 561st, so this must have been a record attendance for poolsbrook. I have to admit that 3 years ago I had never heard of parkrun and then I saw a piece on the national news about a local council wanting to introduce a charge for parkrunners who were using a local park. 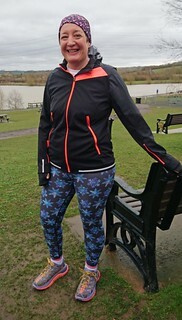 I had just started a C25K programme as I wanted to become more active in order to improve both my mental health and to slow down the impact that Rheumatoid Arthritis was having on my physical health.A quick google search later I was registering for parkrun. 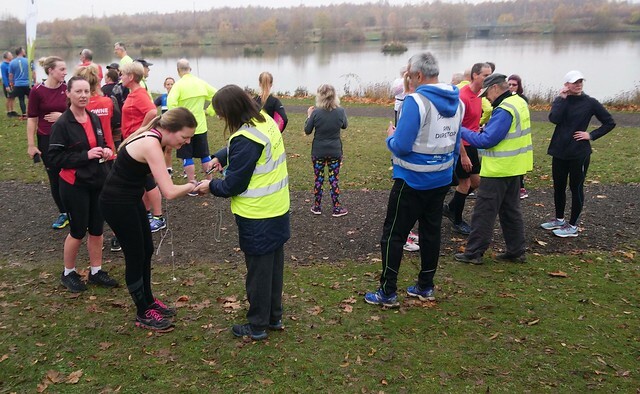 I plucked up the courage to attend my 1st parkrun at Poolsbrook and I was hooked. I didn’t have any aspirations at that time to ever run further than 5K in one go but as my times improved I started to enjoy running, it’s probably more of a quick jog in all honesty ! !, and I’ve now completed a number of 10K runs. I have now decided to take the plunge and move onto the next stage by attempting a half marathon. In March I will be running the Bath Half Marathon and will be combining this with an effort to raise funds for Versus Arthritis. 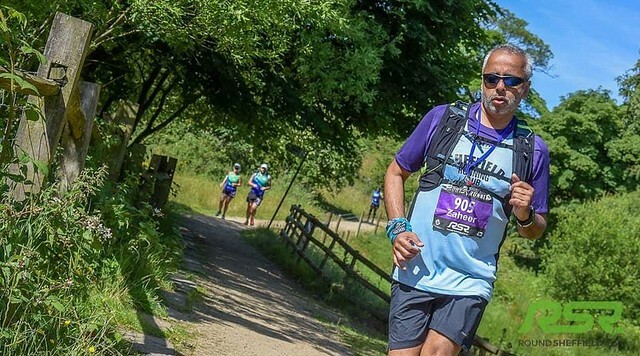 Thanks to research and improvements in medication over the 20 years that I have had Rheumatoid Arthritis I have gone from a position of being barely able to walk due to the pain to feeling confident about completing a Half Marathon. 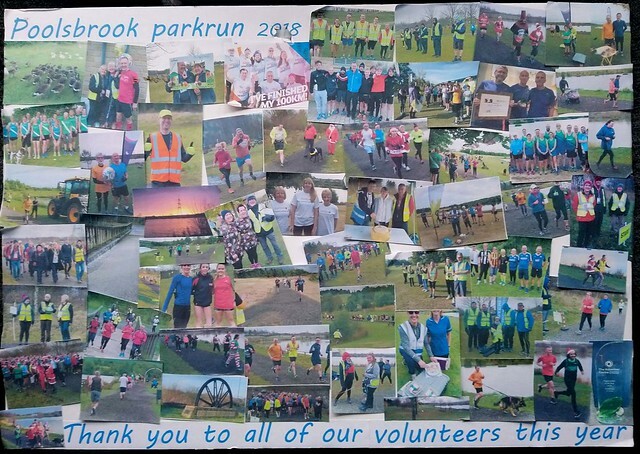 So here it is 2019 and what a start, records tumbling everywhere; for which our Poolsbrook Park Run Organisers deserve great credit, well done indeed you band of heros one and all . So at the end of the festivities let me once more spilt an infinite and mix a metaphor with you this New Year. To say spectacular would be an understatement , from across the pond as you set off there was a cornucopia of colours ( Santa obviously supports Park Run) as a tide of runners swept down the path. Best costume goes to scooby doo, best shirt to the gentleman with the fabulous pink shirt, he looked good in it too and everyone seemed to wear a smile ( where had the hangovers gone). From my vantage point the numbers were impressive but everyone looked out for each other and fast, slow or promenading you all processed beautifully and good manners and courtesy as usual were to the fore. Can I say once again how much I enjoy helping out, as park run is a beacon of hope in these uncertain times, ability, gender, ethnicity whatever matter naught as you all come together in enjoying yourselves; well done to all happy new year , keep smiling and I will continue to watch the kilos fall off the times plummet and the fun continue . Every time I write a run report I praise the volunteers and ask for more in the coming weeks. Why ? Why repeat myself ? Well the simple answer is that this really is OUR parkrun – by that I mean that we are Poolsbrook parkrun – the walkers, joggers, runners and the volunteers – we are the ones that make it happen, we are the ones that ensure that it runs smoothly, we are the ones that make it happy and enjoyable every week, and ultimately – we are the ones that get to take part in whatever way we wish and to reap the benefits. Volunteering is all about us managing our own event in the way that we want it to run – we choose to make ours well organised and happy and everyone of you plays a part in that. Thank you. If you would like to volunteer there are loads of different roles to do – take a look here to see the future roster. 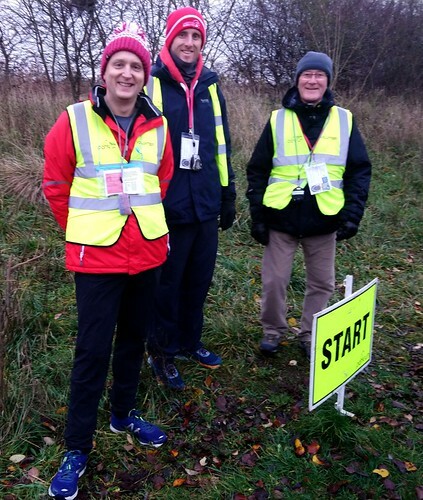 If you are worried about volunteering for the first time, please don’t – everyone is shown what to do as well as given a lanyard with simple instructions and the phone number of the Run Director should they need any help or if they spot any issues during the event. 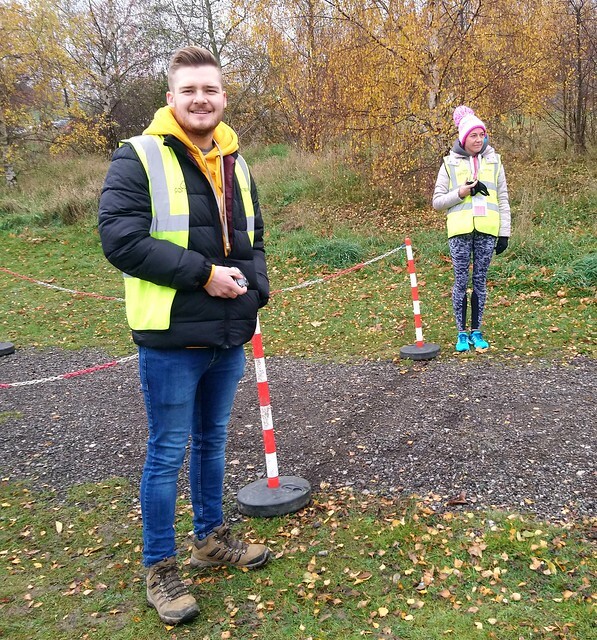 If you don’t want to miss a run – then how about doing one of the roles that allows you to volunteer and take part in the event – these are Tail Walker, VI Guide, Pacer, Pre-event setup, Token sorting, Run Report Writer – you will get both a run credit and a volunteer credit ! You may have noticed that it’s winter – it’s getting colder and that could mean ice. Please check our Facebook page frequently and also our website for any cancellations or warnings about possible cancellations. We will always endeavour to give you as much notice as possible of any cancellations and will only cancel if we feel that your health and safety could be compromised. For the first time this winter we had to make a pre-run course inspection following freezing overnight temperatures, and once again Poolsbrook Country Park showed how resilient it is to winter conditions. There was ice in patches at the side of the paths and some across the paths where water had run from higher to lower ground, but we decided that it wasn’t enough to cause any safety issues – so we went ahead. 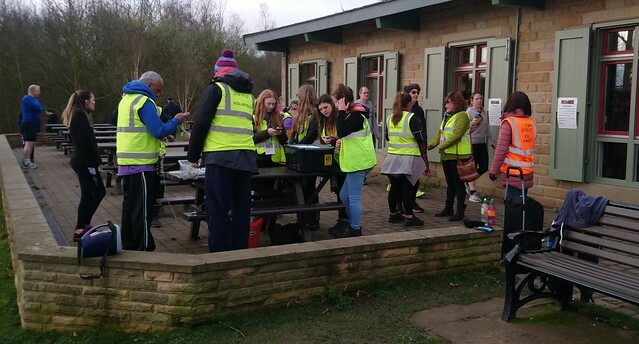 We need volunteers every week to make the event happen and to keep it safe, if you are prepared to help out please leave us a message on our Facebook page or e-mail us at poolsbrookhelpers@parkrun.com . No job is too difficult and they are all rewarding. Roger Run Directed today which meant that our stopwatches were safe, although to be fair he hasn’t broken one in a few months now. Roger gave out instructions to the volunteers whilst Zaheer gave the first timers briefing. Amongst the first timers we had a group from Chesterfield Hockey Club who decided to take part to keep fit now that their season has finished, they will most likely be back again soon. 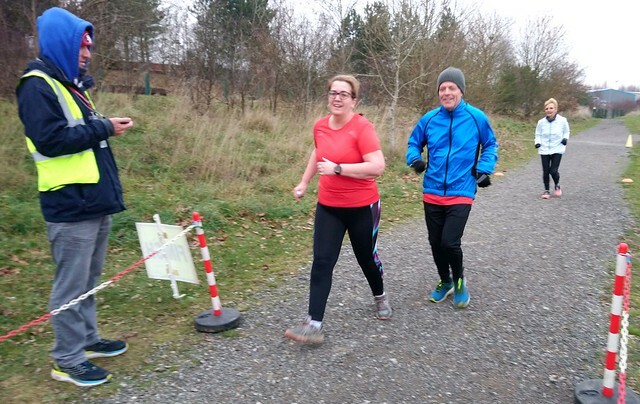 First time parkrunners today were: Christopher GLOSSOP, Ed KINSEY, Helen GLOSSOP, Jonathan HANCOCK, Kristy THEAKER, Louis JOHNSON, Tom BACON, Zoe HIBBARD – welcome to Poolsbrook parkrun. Extra congratulations today to Poolsbrook parkrun regular Michael Joel who volunteered for the 25th time and has earned his purple 25th volunteer t shirt. Michael is one of the hardy types who turns up early to help set-up the event. 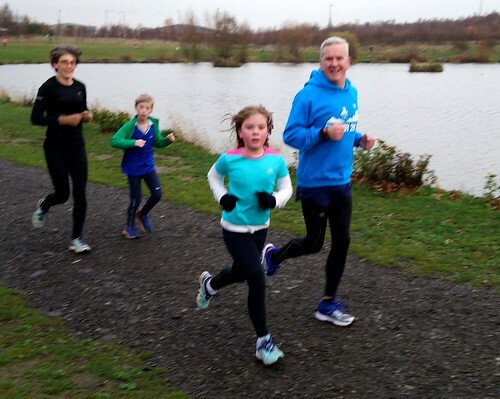 We also greeted a few first time Poolsbrook parkrun visitors: Alfie SUDDRICK, Andy SUDDRICK, Anthony WHITLEY, Christopher HEGGS, Edward GLOSSOP, Ellen WHITE, Hannah BAZLEY, Helen PHILLIPS, Jack BIBBY, John TOSCANO, Martin PHILLIPS, Sean MCAULIFFE, Simon BLACKNELL, we hope you enjoyed our beautiful park. Considering how cold it was today it was pleasing to see a decent number of people taking part. 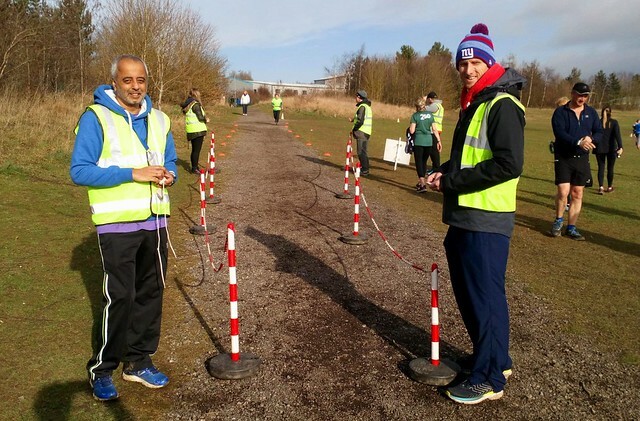 While we were setting up and checking the course before 8am we had guessed that the turnout could have been below 100 for the first time in ages, but Poolsbrook parkrunners are hardier than that and 145 of you defied the cold to get your weekly parkrun fix. Well done to everyone, you got your fix of endorphins today, those that stayed in bed didn’t. 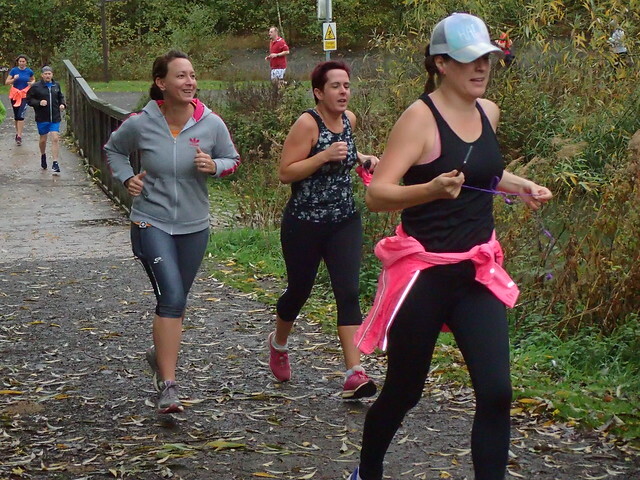 It's common knowledge nowadays that exercise (including walking, jogging and running) is not only good for your physical health, but is also good for your mental health, no wonder we are such a happy bunch at Poolsbrook parkrun. Despite the difficult conditions, and particularly that biting wind on the finish straight, 12 of you managed to achieve personal best times. Congratulations go out to: Bev BARNES, Colin BATEMAN, Donna WOODWARD, Gwilym HAYES, Helena SCHOFIELD, Jason CRABB, Joanne CHAPPELL, Joshua LEUSBY, Liz CLOSE, Seth CLOSE, Simon HARRISON, Vicki MIRFIN. 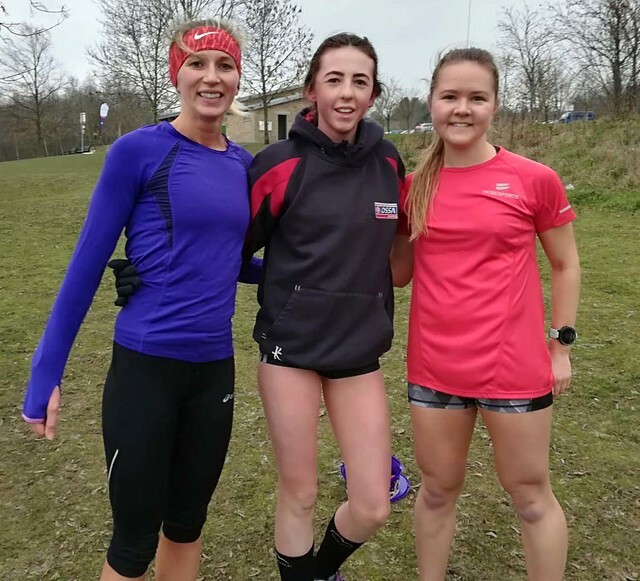 It was great to see some fantastic female runners today with 3 of them finishing in the first 6 places: Helena SCHOFIELD, Louise COCKING and Lauren DAVIES-BECKETT. 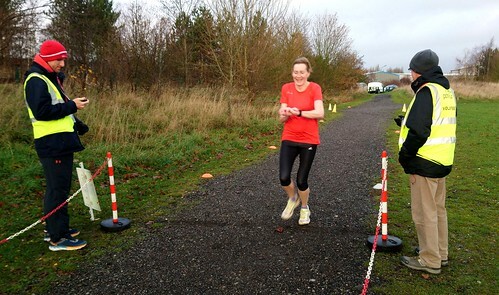 Lauren achieved a Poolsbrook parkrun age graded record for the SW20-24 group of 74.06%, congratulations Lauren. Weather – please ensure that you check our Facebook page regularly for updates about how the weather might affect our events, we will always do our best to keep you informed. 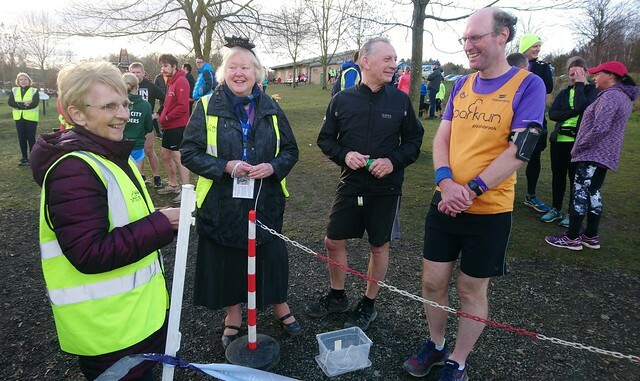 Did you know – our highest ever attendance was on New Years Day this year when we welcomed 473 participants, we ran out of finish tokens and had to record the last 20 or so finishers by writing on bits of paper. Also, we were at the limits of our stopwatches capabilities, they can only record about 490 finishers. This year we will be ready just in case this happens again, we have new stopwatches available which can record more than 1,000 finishers and we have extra finish tokens taking us up to about 650 participants. 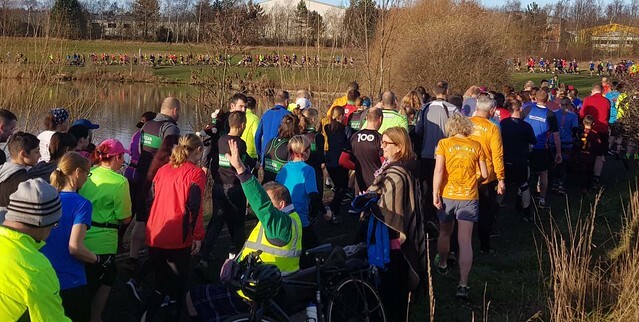 As we are nearing the end of another year, it would be great to hear form you about your best memories of Poolsbrook parkrun in 2018 – drop us a line, iot only needs to be a paragraph and it would be nice to publish a few memories in the run report. E-mail us at poolsbrookhelpers@parkrun.com . We have a busy time coming up for Poolsbrook parkrun with a couple of extra events and our Christmas special. A chance to wear your Christmas fancy dress, we hope to see lot’s of Santa’s, Elves, Snowmen and Reindeers (or any other outfit that you would like to wear). The café won’t be open this week but we hope to be able to open up the building on the day. Please bring along your own Christmas treats to share – mince pies, Christmas cake etc. What better way to start Christmas day than a parkrun – burn a few calories before you fill yourself on Christmas dinner. Why not bring along family members or friends. The café won’t be open, we may open up the building but suspect that a lot of you will want a quick get away. Bring along your own treats. Of course, Christmas fancy dress will be welcomed. The café will be closed so we hope to open the building. Please bring along your festive treats to share. We still need lots of volunteers to be able to hold these extra events so if you can help please let us know as soon as possible. We can’t do it without you ! 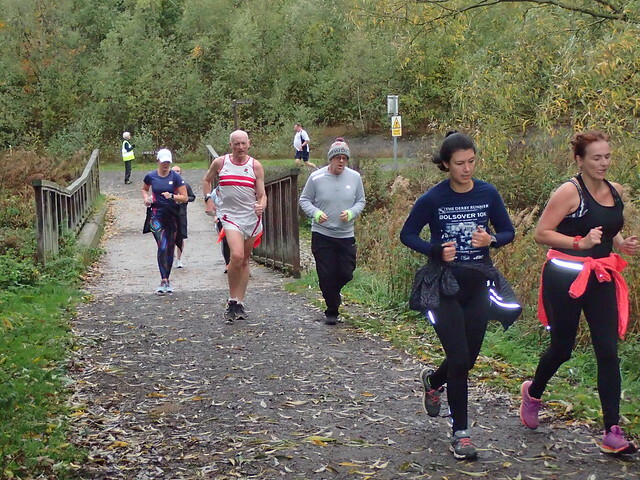 50 parkruns – Richard Harding, Hannah Woods, Tina Cheetham, Libby Woodhouse – the latter two were first time visitors. Congratulations to all of you and here’s to your next milestones. If you can help us next week or on any week in the future just leave us a message on our Facebook page or e-mail us at poolsbrookhelpers@parkrun.com . We can’t do it without you and your efforts are always very much appreciated. In addition, we are currently seeking volunteers for Christmas day and New Years day - if you can help on either of these days, please let us know. This week we welcomed two people who took part in parkrun for the first time, Ben MARSHALL, Chloe CARRINGTON. We hope to see you both again next week. 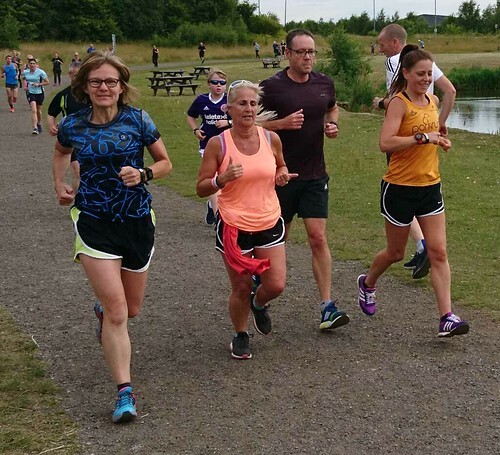 We also welcomed first time Poolsbrook parkrun visitors Tina CHEETHAM, Libby WOODHOUSE, Melissa HUDSON, Natasha CARVER, Reece CARVER, Neil BUSSEY, Shelagh MITSON, Sam FOSTER, Steven ALLEN, Tommy DICKSON, Paul WOODHOUSE. 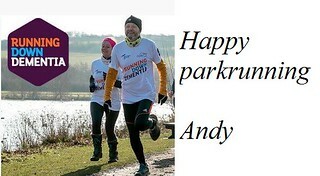 We hope that you enjoyed our parkrun. Congratulations to the following people who earned a PB this week: Samantha WARD, Simon HARRISON, Luke PAYNE, Emma TWYFORD, Joshua LEUSBY, Julie SIDWELL, Fran MOSSMAN, Imelda COLE, Clare MCSHANE, William TREVES, Lucy RUNDELL, Ryan WOOD, Susan GOODWIN, Stephen MCFARLING, Gemma MORRIS, Nicky WHELAN, Murray WHITE, Jules FOSTER, Ian ATKINSON, Keith HIRST, Niki HOBSON, James CROWDER, Heather HILL. 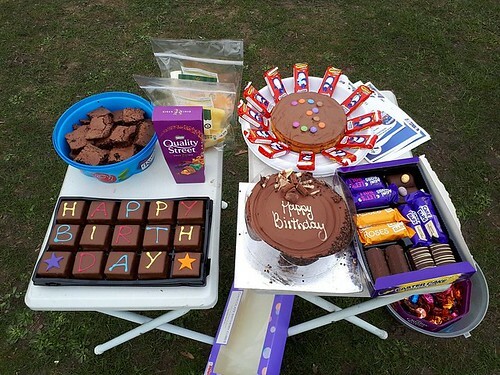 Two of our regulars who achieved milestones this week have provided a few words for you to share, and many thanks to both of you for the cakes - they went down very well. Today’s my 50th run and also possibly my 10th without a hangover (we’ll see). Everyone has their own reasons for taking part at parkrun, I had a couple. Firstly I tore my cruciate ligament and after a few years of trying to play football without one I realised it wasn’t possible and I needed something else to keep me active. Secondly, and the larger influence, was my Dad, who’s doing his 100th today. He’d been at me for months telling me how good parkrun was and I finally, almost reluctantly, agreed to join him. He dragged me round that first time and we finished together at the line. Since then in all but 3 of my runs we’ve finished together and that’s the important thing for me as well as the debrief over a cup of tea. The hardest part remains getting to the start line! 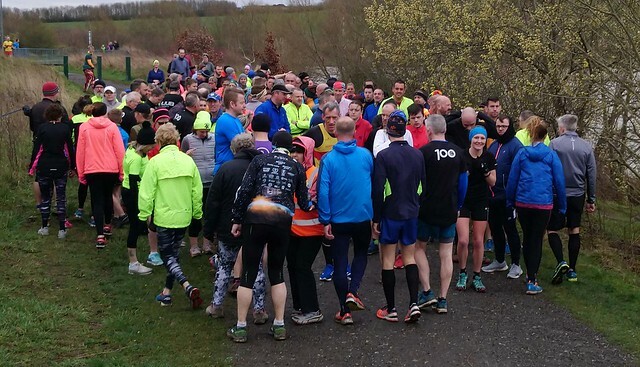 Just a few lines for my 100th- It was with childish excitement and a bit of nervousness that I approached Poolsbrook parkrun this week. It seems unbelievable to be running my 100th parkrun , to share it with my son’s 50th made it even more special. Nothing has changed since I gave my story at the 50 milestone, just met more of the parkrun family! Thank you again to all the amazing volunteers, stars every one. 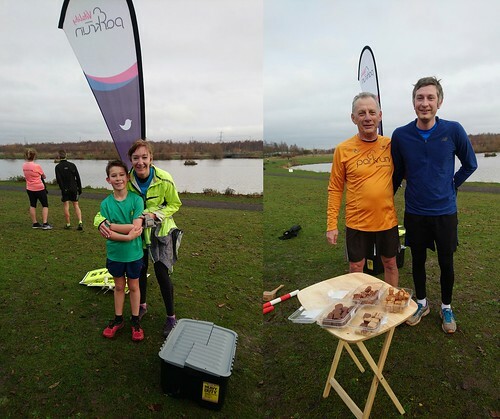 Thank you both for your stories – we’d love to hear more, if you would like to share your story please e-mail it to us at poolsbrookoffice@parkrun.com , thank you. 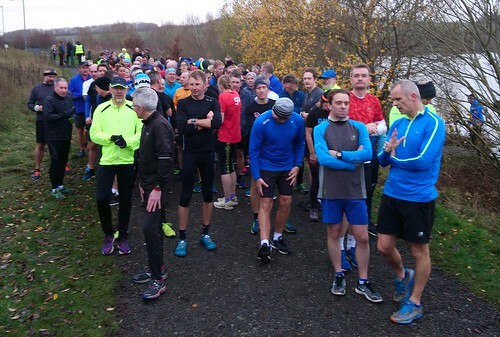 For a full list of festive parkruns – look here. Lost property - we have quite a few items of lost property at the moment and can only reasonably hang onto it for a short time as it takes up space and we have to transport it to and from Poolsbrook every week. If you let us know if you have left anything behind and also when you will be able to pick it up, then we will ensure the item is waiting for you when you are ready to collect it. Otherwise, after a few weeks we will either take the item to a charity shop, or dispose of it if it can’t be recycled any other way. 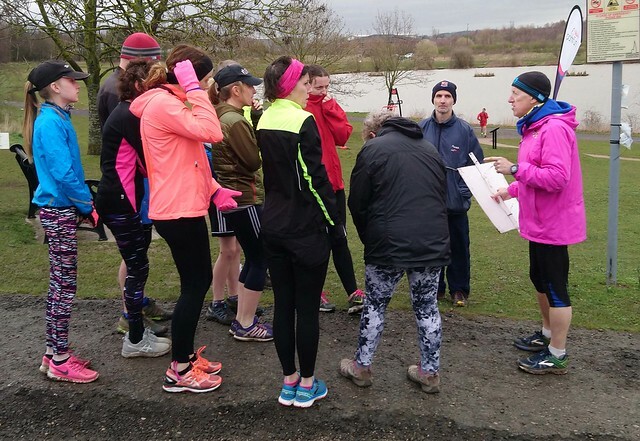 Run report – would you like to have a go at writing a run report ? It doesn’t have to be anything fancy, just your view of the event that you just took part in or volunteered at. It’s nice to hear a new voice and you get a volunteer credit for it. All you need to do is to send the words to me, I’ll put it in a format that can be published and add photographs (unless you send your own). Let us know on our Facebook page, or speak to the Run Director before or after an event to offer your help – in the same way that you would volunteer for any other role. I won’t be here for the next parkrun as I’ll be somewhere warmer. I’ll be thinking of you – have a great parkrun. It was great to see 216 of you on what was a cool and crisp morning - what I would describe as perfect running conditions. Although next week’s rota is pretty much full, we could always do with a few more volunteers in the following weeks, and especially for our Christmas Day and New Years Day events. Please email us at poolsbrookhelpers@parkrun.com . Some roles such as pre-event setup and Tail Walker allow a run credit as well as a volunteer credit - great for those wanting that milestone T shirt! You can see our event's future volunteer roster via our future roster page. Now on to the milestones. Matt TAYLOR reached the 25th volunteer milestone today. We look forward to seeing you in your new milestone T shirts soon! Thankfully no finish tokens went missing today - which is just the way we like it as they are expensive to replace. After getting your barcode scanned along with your finish token please remember to hand your token back to the barcode scanner, even if you forgot your barcode - and unforunately 6 of you did today, which means your’e all classed as 'unknown' in the results. Are you a tourist , or even a regular here and fancy writing the run report? We always welcome others' perception of our event, and by writing the run report you'll get a volunteer credit as well. Please email us on poolsbrookhelpers@parkrun.com and we'll add you to the roster. 24 November - after the parkrun at 10:30 we have a first aid course open to everyone. Places are limited though, so if you want to attend please email us at poolsbrookhelpers@parkrun.com . What a beautiful day and a wonderful way to start the weekend. 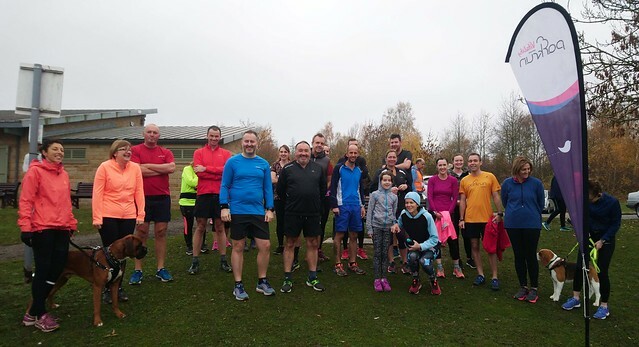 What could be better than getting up early to run around the beautiful Poolsbrook Country park with friends and family, and being rewarded by lovely sunshine and above average temperatures for the time of year ? Next week it could be you ! 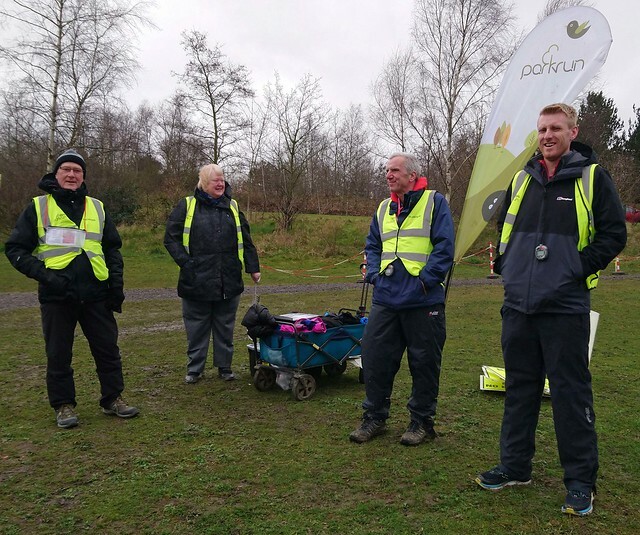 We need volunteers to make our event happen, and as we grow bigger we need more volunteers – so if you feel like supporting your local parkrun please consider volunteering. As usual you can let us know by leaving a message on our Facebook page, or by e-mailing us at poolsbrookhelpers@parkrun.com . If you would like to see what volunteer roles still need filling for the next few weeks take a look here. As we are now in November, in addition to the usual call for volunteers for the next few weeks, I’d like to remind everyone that we are going to need volunteers for Christmas day and New Years Day. If you are prepared to help us to put on these two extra events over the festive period, please let us know in the usual way. 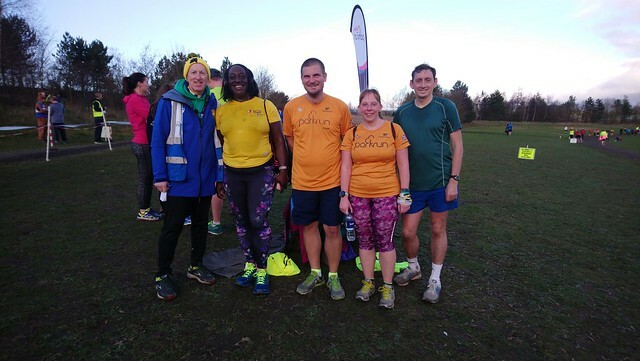 It was great to see 11 new parkrunners yesterday, and we really hope to see them as regulars at Poolsbrook parkrun in the future. This week we welcomed Adam SKELDING, Colin HARRIS, Emma TWYFORD, Fran MOSSMAN, Ian SUTTON, Joanne CHAPPELL, Nicole EVANS, Rowan ROBERTS, Sarah HICKEY, Will NORTH, Zoe THOMPSON. 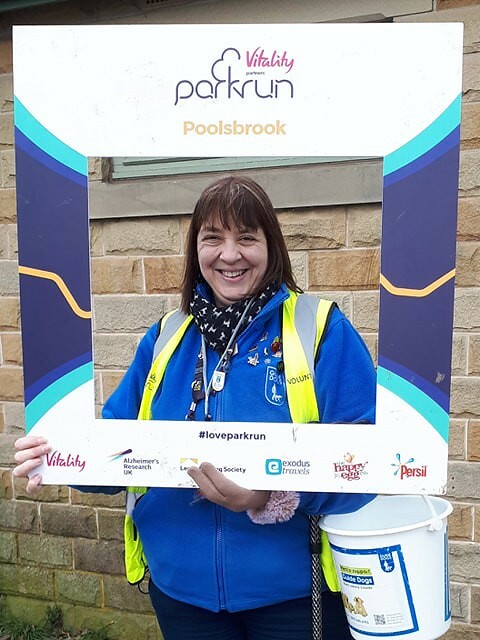 We also love to meet visitors and this week the following people visited Poolsbrook parkrun for the first time: Aston PERRIN, Brendan SMITH, Craig LEE, Dave NUTTON, Jake LODGE, Julian BLOOR, Kate FLETCHER, Mark ROCKEY, Megan JOHNSON, Nadine HILLS, Toni BRIGGS, Zoe RYLATT. For some reason we had a lot of unknown participants this week – we can only assume that they didn’t bring their barcodes with them which seems like a shame as it means that they don’t get an official result. 16 unknowns is a pretty high number for us – so who were you ? On a brighter side, congratulations to everyone who achieved a Personal Best (PB) this week: Adrian MCGUIRE, Amy DILLON, David BARKER, David BROWN, Diane OSHEA, Gemma MORRIS, Georgina SMITH, Hannah WOODS, Heather HILL, Helen COE, Henry KAY, Jamie HOWARD, Jonathan THACKRAY, Karen READ, Katie WALTON, Keith GREEN, Keith HIRST, Kerrigan SHAW, Lisa SAICH, Louise BEACH, Matthew TOMLINSON, Nigel SAUL, Oskar WOODS, Paul MULLISS, Peter HOOLEY, Tanya BEIGHTON, Tina HENSEY. We always ask about milestones at the start of an event, but this week we didn’t get any hands shown so assumed that we didn’t have any. 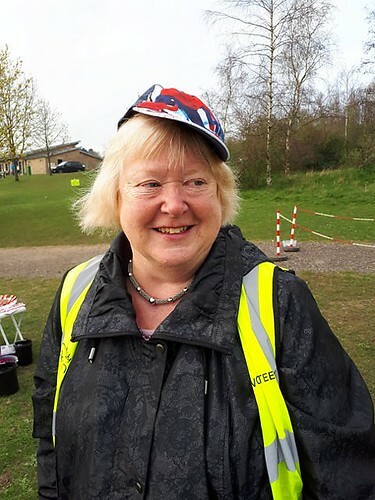 However Jane Boot took part in her 50th event today and they have all been at Poolsbrook parkrun. Congratulations Jane. It looks like we’ve got a few regulars who are close to their milestones – so please let us know, ideally beforehand so that we can give you a mention in the run briefing. As a reminder, we are offering a free of charge 2 hours first aid course on Saturday 24th November starting at 1030AM straight after our parkrun. If you would like to take part please let us know by e-mailing us at poolsbrookoffice@parkrun.com – we are keen to have as many people around with basic first aid training as possible. Let’s do it all again next week ! Running on the spot ! It was an interesting start to the day with the car’s temperature gauge reading 17C on arrival but with a cloudy sky, blustery wind and light rain. Not exactly ideal running conditions, but also not enough to put off the 127 walkers, joggers and runners that took part. Many thanks to the terrific team of volunteers this week, Andy MORRIS • Andy PORTWOOD • Carol Ann WOLSTENHOLME • Cath BADHAM • Chris PATTISON • Ellis HEWITT • Heather HILL • Janet HESLIP • Jean BAKER • Keith HUDSON • Lionel WOLSTENHOLME • Mark HAZLEHURST • Matt TAYLOR • Michael JOEL • Paul TAYLOR • Roger KENCH • Ruth SMITH • Stephen HESLIP • Stephen RUNDELL • William STREET – we couldn’t have done it without you. 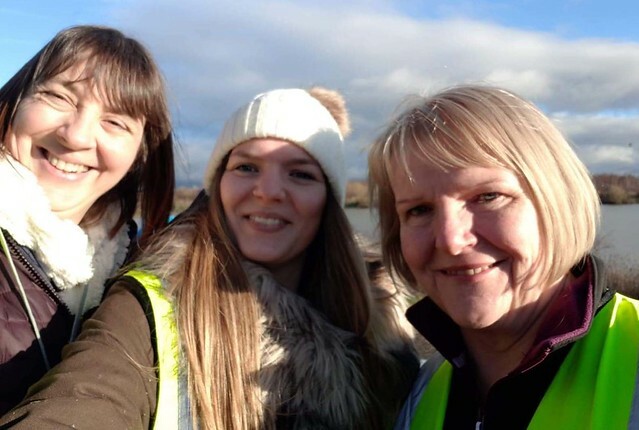 If you would like to give something back to your local parkrun by volunteering, please leave us a message on our Facebook page or e-mail us at poolsbrookhelpers@parkrun.com – we always appreciate your support, and after all – it’s fun to volunteer. Chris was Run Director today, and he failed to tell us that he was volunteering for the 100th time – actually he told us that he didn’t realise ! Well, I for one think that he wanted to share his blushes by announcing it himself – so we’ve asked next week’s RD, Roger to announce it then, and don’t forget to congratulate him. 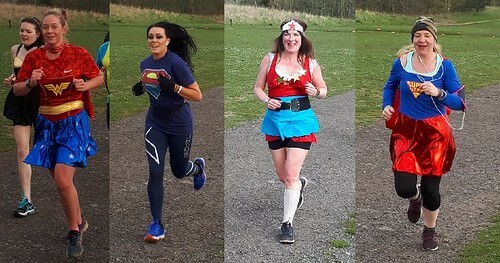 The following 7 people completed their first ever parkrun today Adrienne HOPKINS, Amanda HARBOTTLE, Amber BECKETT, Amelia BECKETT, Clare MCSHANE, Craig SLATER, Russell BARRON – congratulations to all of you – see you next week. 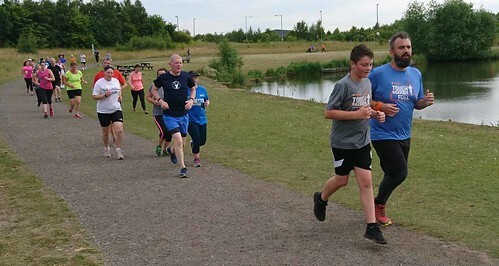 Our first time visitors were Alan TONKS, Alix MCKILLOP, Craig SANKEY, David CLARKE, Howard DARWIN, Julie ATKINSON, Lisa BROCKLEHURST, Stephen ORAM – welcome to Poolsbrook parkrun, we hope you enjoyed our event today. We love milestones, and in addition to Chris’s volunteer milestone we had a 50th parkrun from Gwilym HAYES (5 at Poolsbrook). It’s worth also noting that Stephen MOSS is on 49 runs, and both Ivan GLOSSOP and Roy SMITH are on 99 ! Not surprisingly, the difficult conditions didn’t lend themselves to many PBs, so even greater praise has to be given to those that achieved them this week, Diane OSHEA, Helen TURNER, Martin FINCH, Martyn SHAWCROFT, Mary BOWN, Matthew PRIOR, Nina MORGAN, Richard DOWNES, Sarah SAUNDERS, Shane SAUNDERS, Stuart TURNER, Tilly LAWSON. It was a bit of a challenge running along the home straight with the wind right in your face it felt like running on the spot, but also a nice change to have the wind with you on the long straight between the bridge and the Erin Road car park – you win some, you lose some ! For those of you interested in doing a New Years Day ‘double’ you can check out which other parkrun’s will be operating by following this link. Please bear in mind that a lot of parkruns won’t make up their minds until much closer to the date, so keep looking. Note – Clumber have declared for 9AM on NYD and Graves usually do the same (but have not yet declared). Note that we are looking for volunteer for Christmas day and New Years day, if you can help, please let us know in the usual way. Many thanks to Lionel and Carol for providing the photographs this week. 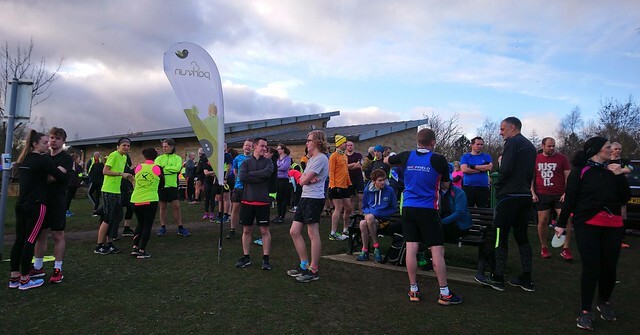 Once again we had a welcome influx of first time parkrunners, this week we said hello to Ryan SKIDMORE, Joel MOORE, Steve LAWES, Jonathan MOORE, Peter ORME, Clare MOORE, Kai UNWIN, Darcie BATTY, Mackenzie PARKIN, Lucy HEATHCOTE, Dawn JARVIS, Susan CROMPTON, Freddie BESTWICK, Christine WRIGHT. 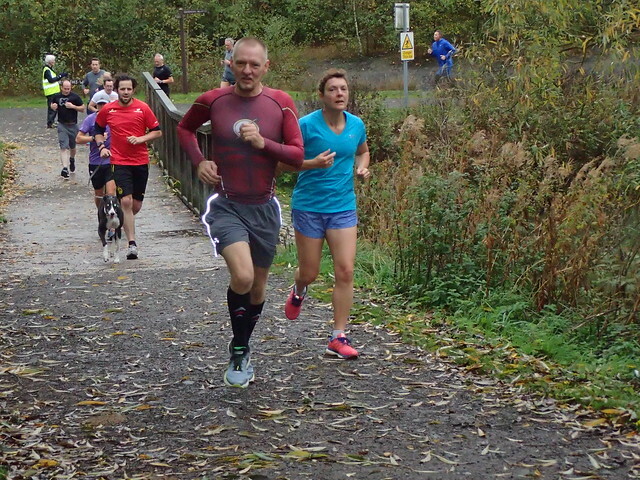 Hopefully you enjoyed your first parkrun experience and will be back next week. 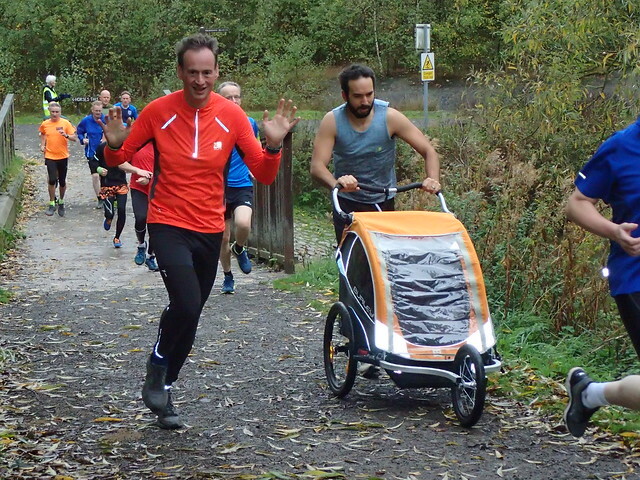 We also met lots of first time Poolsbrook parkrun tourists from all over the UK, including one of the original time trailers from Bushy Park. The Poolsbrook family welcomes you all and hope you had an enjoyable experience with us. Tom SAMPLE, Kristian SILCOCK, Hannah PATTISON-SMITH, Mark BEE, Jude RYAN, Jordan HOWARD, Barry FAULKNER, Lee CODDINGTON, Richard BENNETT, Anna NAYLOR, Rochelle CRAWFORD, Kirsty BOWEN, Catherine BLACKBURN, Sam BROWN, Gary BERZINS, Daniel MORRIS, Steven THORPE, John MILINS, Christina BRADY, Kieran DESMOND, Ji PATTISON-SMITH, Carl MULLOOLY, Tim DODD, Robin SCHUMACHER, Derek MOFFATT, Wayne WRIGHT, Jim DESMOND. I believe that this is the first time as Run Director that I have walked back from the start to the finish line to be greeted by someone who already needed first aid ! The good news is that the lady in question then completed the run – we are a hardy bunch. Thinking about injuries, we had 3 people who required first aid this week, all trips on the loose surface. There isn’t anything that we can do to change the surface other than remove any obviously large rocks when we are setting up which is why we tend to mention it in the pre-run briefing. So, please take care, especially at the edges of the path, and if you happen to be doing a warm up lap and see anything that people could trip over, it would be appreciated if you could kick it onto the grass, out of harms way. Well, at least I get to practice my first aid occasionally ! It was a pretty good day for PBs this week not surprisingly. 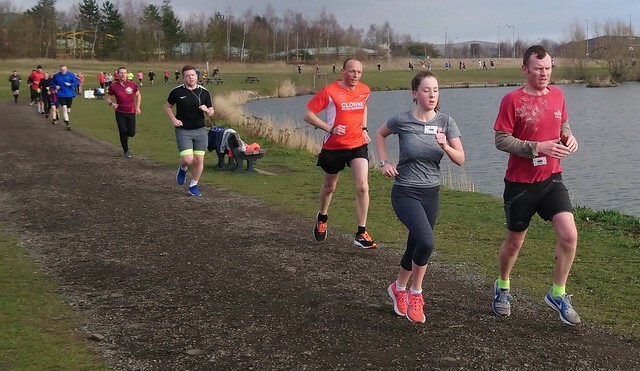 Well done to the following people who clocked up their fastest time so far at Poolsbrook parkrun: Mark BADGER, Kayleigh CHESTER, Michelle CADET-ROSE, Matthew GOULD, Lucy FALLON, David SMITH, Andrew LONGDEN, Robert GILL, Rob CUMMINS, Neil ROBINS, Jessica BEIGHTON, Charlie CUMMINS, Matt CONSTABLE, Tom CHARLESWORTH, Kaylie TRAVIS, Lynn PITTUCK, Karen JENKINSON, Oli CONSTABLE, Murray WHITE, Tracy COGGER, Stephanie HILL, Kerrie HOLLAND, Georgia BALL, Gemma BEECHAM, Hannah HAWKINS, Nina MORGAN, Tracy UNWIN,Lee GIBBS, Christopher BLACKBURN, Richard Peter ROTHWELL-JACKSON, Paul SMITH, Maria PRENDERGAST, Kristian WATSON, Chris PAYNE, Denise SHAW, Liam HALL, Ian THOMAS, Hannah SHARPE, Eve CONNOLLY, Wayne CHURCH, Dawn BROOKS, Craig LOCKETT, Ruth SMITH, Mark SIMMONITE, Andrew LITTLE, Gordon HARDING, Paul CASTLEDINE, Tom COPPING, Leanora SIMMONITE, Chris AMERY, Jonathan PAGDIN. I would especially like to congratulate the amazing Chris Payne who finished in under 1 hour for the first time along with his guide dog, that was a fantastic effort and I have no doubt at all that Chris will do it again. New age graded records were set this week by first finisher SM30-34 Kristian Watson with 78.46% (our 7th fastest time) and JM10 Jude Ryan with an amazing 81.43%. Congratulations to both of you. 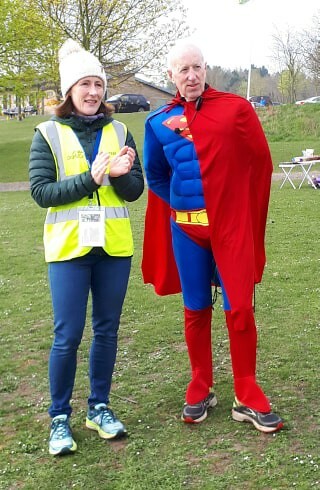 We didn’t get any milestone runs this week, so instead I’d like to congratulate the following people who did their 2nd parkrun which I hope means that they have now got the parkrun bug: Tom SAMPLE, Kristian SILCOCK, Mark BADGER, Kayleigh CHESTER, Michelle CADET-ROSE, Tara HEATH, Polly MEIKLE. See you next week. 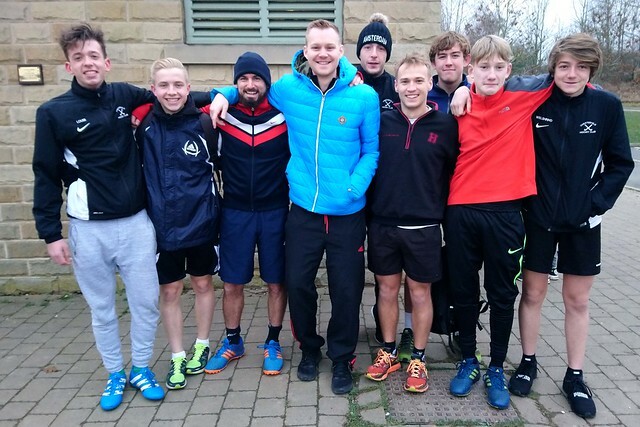 This week, members of 25 different running clubs took part with the most fromNOrth Derbyshire RC (19 people), and Clowne RRC (10 people). If you are a member of a running club that would like to host an event takeover in the future, please let us know either via our Facebook page or by e-mailing poolsbrookoffice@parkrun.com – we would welcome you. 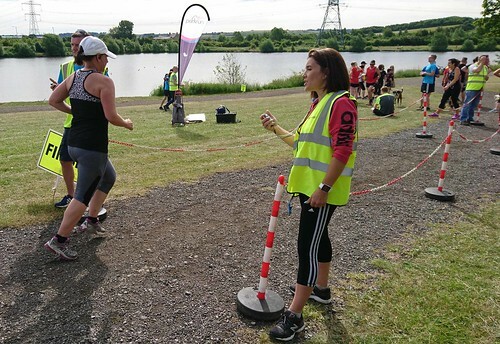 I’ve been asked to remind parkrunners that we can only add you to the results if your barcode fails to scan – this is a strict rule from parkrun HQ designed to reduce the burden on the core team for updating results manually. We will scan paper barcodes, wristbands or any other official parkrun media. We will not attempt to scan phones. Put simply – all we ask participants to bring with them each week is their personal barcode. Compare this to what the core team have to bring each week – including: PA system (amplifier/speaker, transmitter, receiver), laptop and multiple cables, stopwatches, barcode scanners, volunteer roster, non-scanning sheets, future volunteer sheet, whiteboard, 19 bibs, mallet, first aid kit, lost property, and various other bits and pieces that we need or might need each week. And all of these items need to be washed/folded, or charged, or reset, and stored at home. Then when we get to Poolsbrook we have to get all of the other kit out of storage and set it up including the finish funnel, signs, flags, cones etc. We are happy to do this every week – all we ask is please bring your barcode ! On a really happy note, I am always proud to hear great feedback about our event, and it’s something that we get regularly. It can be about the venue – a beautiful park, the organisation, or the friendliness of everyone – this is undoubtedly my favourite comment. 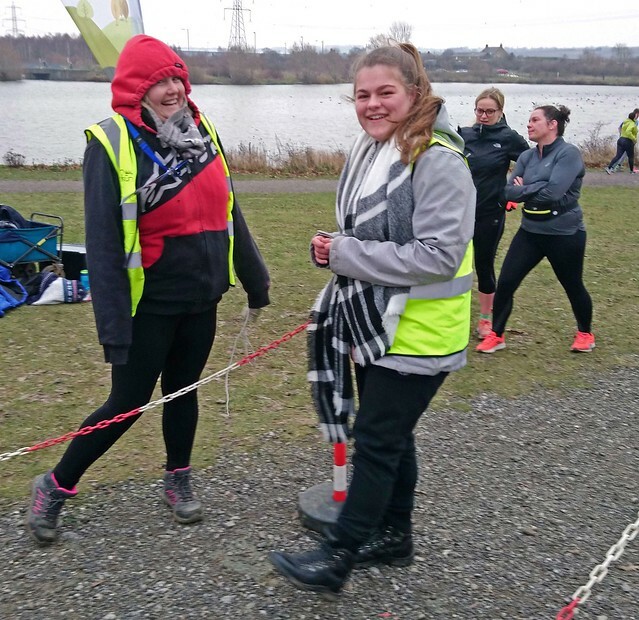 Thank you to everyone who walks, jogs, runs or volunteers – it is you who make our event so friendly – let’s encourage these nice comments from our visitors. 7th July – Armed Forces day, there will be no Poolsbrook parkrun – time for a bit of tourism. We will be planning other themed events for the rest of the year soon, watch this space.